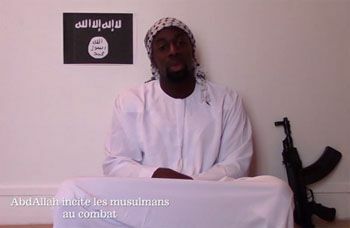 One issue regarding the Kosher market attacks by Coulibaly continues to have conflicting information: his motive for picking the Kosher market. In his swan song video and his conversations recorded when his phone had not hung up after talking to a news station, he doesn't mention animosity towards Jews as a motive. His anger is directed at the French Government. Al Hayat Media, one of the media arms for the Islamic State (ISIS) has released a “martyrdom” video of Almedy Coulibaly, recorded before the Kosher market siege, pledging allegiance to the Islamic State and explaining his reasons for hooking up with the Kouachi brothers and embarking on his killing spree. It’s already down from You Tube, but you can watch it here, here or here. Even though it is in French, I suggest you watch it to see the editing. If you'd rather read about it, descriptions by the media are here and here.